Android is Google's distribution of Linux targeted mainly at smartphones and tablets, there are also variants of Android that run on smartwatches, televisions, and cars. Android was originally developed by a company called Android Inc., but Google then bought the company in 2005-07, then made the Android SDK available in 2007-11. One year later, the first version of Android was released in 2008-09. The latest version of Android is currently Android 9.0 which was released on 2018-08-06. 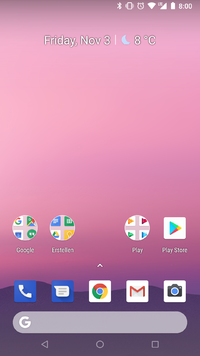 The latest beta version of Android is currently Android 10.x Beta 2 which was released on 2019-04-03. Every major Android version since 1.5 has a codename based on different desserts, they are all in alphabetical order. Android 1.x Petit Four, Cupcake, Donut 2008-09-23 HTC Dream was the first phone to be released with Android. Android 2.x Eclair, Froyo, Gingerbread 2009-10-26 Supported more screen resolutions. Android 3.x Honeycomb 2011-02-22 This version was targeted at tablets only. Android 4.x Ice Cream Sandwich, Jelly Bean, KitKat 2011-10-18 First version to integrate the screenshot feature. Android 5.x Lollipop 2014-11-12 Indroduced brand new design known as Material Design. Android 6.x Marshmallow 2015-10-05 First version to support USB-C.
Android 7.x Nougat 2016-08-22 First version to have multi-window support. Android 8.x Oreo 2017-08-21 First version to have picture-in-picture support. Android 9.x Pie 2018-08-06 First version to have time limits for apps. Android 10.x Q TBA 2019 Beta version of Android to be released in the third quarter of 2019. This page was last edited on 10 April 2019, at 14:27.